We never get tired of sharing our newest brews with you! I hope this craft beer blog keeps you swinging by to see what catches your eye in our store. Again, hit up our Product Requests form if you’d like to see a little more of your favourite somethin’ somethin’. We are happy to help. 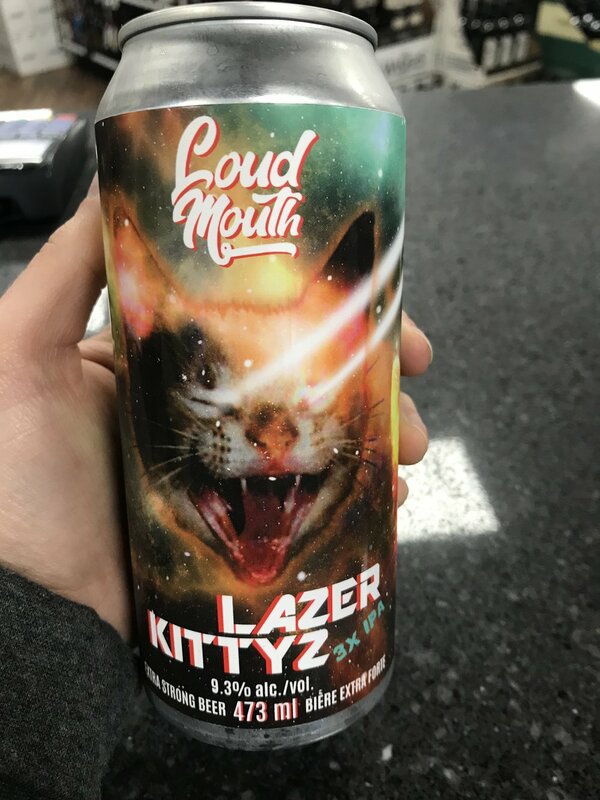 We were excited to introduce Loud Mouth Brewing from Abbotsford into our store last week, and we are happy again to carry another one of their spectacular brews - their all new LAZER KITTYZ Triple IPA. This is their first can release (shortly followed by their first bottle release which was just last week for us) and it’s another one for the books. This hazy triple IPA is not only strong and hazy, but juicy as ever. The juicy beauty of this beer comes from the Huell Melon hops that are packed into the kitty-covered can. You don’t have to like cats to drink this beer, but a big bonus if you do. HAVE I BEEN DRINKING OR IS THERE A CAR IN SPACE? Red Truck Beer brought in this funky new 8-pack of their El Space Camino Dry Hopped Ale. Brewed in Vancouver, not in space. I guess the name was inspired by the hops that make this dry-hopped ale: Galaxy and El Dorado. They call its character that of “celestial malt” that really makes it “out of this world.” Clever packaging and good beer all makes for a good time drinking if you ask me. Hop in your car, that’s probably not an El Camino, drive over to Lickman Liquor (located in the Milky Way Galaxy) and pick up this 8-pack, ASAP! Superflux brought back their limited release which we saw for the first time last year: “Craft Beer is Dead”. Since then, it has been long anticipated by many. This American IPA is hopped with Chinook, Centennial, Cascade and Citra hops. There’s a smooth taste with aromatics of pine, citrus, and even some tropical notes. It is well-loved by us (and all of our craft beer drinking customers) at Lickman Liquor. You’ll have to hop on over to our store QUICK before we run out of it already! …and it’s even made with the real peel. What a deal. Summer came early with this Grapefruit IPA called “The Real Peel” by Fernie Brewing. This brew will give you the most refreshing punch you’ve ever received. Its bold citrus and grapefruit taste will have you sippin’ all Summer long and you might even forget that Summer is still quite far away. The Real Peel is hopped with Amarillo, Centennial, and Citra hops to make its light, but bold taste. Don’t be fooled - it’s not a radler - but just as refreshing as one. This baby comes in single tall cans located in our tall can fridge. Grab one on the way to the beach… if you’re up to the challenge in this unpredictable Spring weather. Double the IPA, double the fun. Another addition into our singles fridge this week is Steamworks' new Limited Edition Battleship Double IPA. The newest brew to Steamworks is strong, juicy, and dry-hopped (not once, but twice). Despite the strong punch of this DIPA, it has been brewed so beautifully that is still very drinkable and gives you that tropical taste that we are all yearning for as Summer slowly approaches. And hey, maybe you can drink it while you dust off the old Battleship game and call “G3” with your buddy. New drinking game: every time you miss, you drink. You’ll be drunk in no time. YOU DON’T HAVE TO BE A MORNING PERSON TO DRINK THIS ONE. DON’T WORRY. 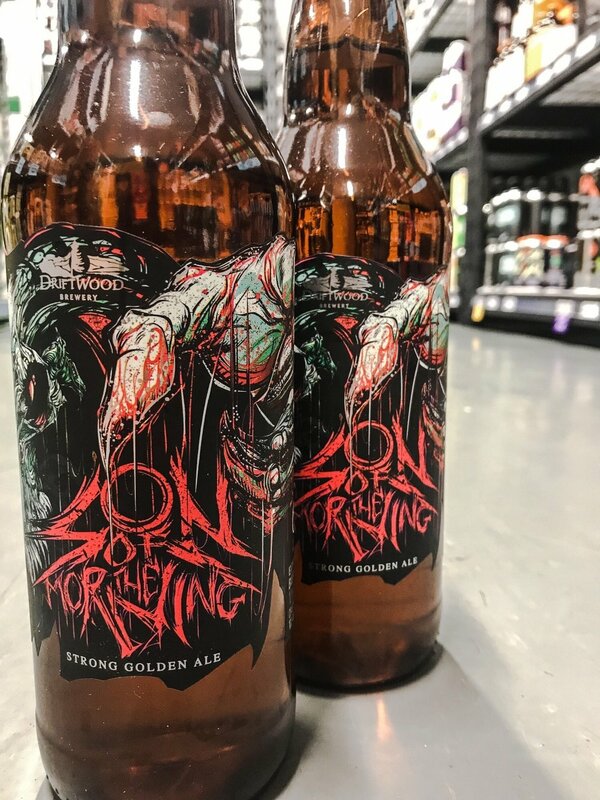 Driftwood’s “Son of the Morning” gives itself a bad rep by name (google it if you’re not sure what they were getting at with this name), but I think they call it that because it’s devilishly good. This strong golden ale is hopped with Hallertauer hops and brewed with Pilsner and Carapils malts. This is another special release, so don’t wait to long to hop on this one. If you like your beer strong without being too dark, this one’s for you. howe does this sound? you tell me. We like our beers good and we like them big. It feels like it’s been a long time coming but maybe it’s because we have just been standing waiting at the door for them to come back… Howe Sound brought back their award-winning King Heffy Imperial Heffeweizen, a crowd favourite for many. Fit for kings, it’s brewed with German hefe yeast, malted barley, white wheat, and hopped with Amarillo and Saaz hops. Another favourite is their Jam Session Raspberry Cream Ale, which is packed full of real raspberries to give an easy-drinking, delicious and light fruity beer. It’s the perfect beer to sip all the way from Spring to Summer. These brews got us wishing there was more time in our days and more room in our glasses.